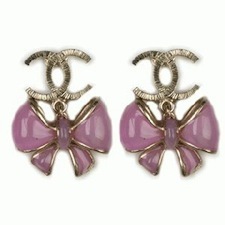 Replica Chanel earrings that were being offered for sale at chanelnecklace.org were typically priced between $26.00 and $65.00. A logical reason why the prices for replica Chanel earrings are frequently so low is that the earrings are illegally manufactured by factories often using low-grade materials and much less-trained labor. A replica Chanel pair of earrings may be tempting to some shoppers at first because of the reduced prices, but they will often lack quality in the stones, clasps and backers which may fall apart or slip off easily. Only an authentic pair of CHANEL earrings will deliver fine-grade stones, strong clasps, comfortable backers and precision craftsmanship. Replicas will not bring you the beauty and elegance of a genuine.